With close collaboration between the Long Beach, California's Parks engineers and Assured Automation, design flaws that plagued their new Wave Fountain were overcome to provide a new attraction to the Queen Mary Events Park and Aquarium, adding dynamic impact to the nationally acclaimed park. With water being pumped at the rate of 11,000 gallons per minute, it was no less than a harrowing experience to the Parks engineers when the original fountain design failed. "The water hammering felt like a gunnery range," recalls Dave Edgar, mechanical engineer for the City of Long Branch. "Imagine thousand pounds of metal objects slamming and pounding all at the same time." Originally trained as a Hull Technician in the Navy, and then as a marine pipe fitter for the Long Beach Naval Shipyard, Edgar knew from experience the existing design would never work. Finding alternatives - especially in an environment where a test prototype was not an option -- needed resourceful and daring minds. The Long Beach Wave Fountain presented rigorous -- literally crushing - requirements. And as a municipal park fountain, the requirements for minimal maintenance and reliable performance were strict. The OMAL Ares Angle Seat Valves were selected for their high cycle-life, durability and reliability, and compact assembly. "Finding the right valve for our Wave Fountain was key to the success of the project," recalls Edgar. "Other more common valves could not meet our stringent requirements. We worked collaboratively with the engineers at Assured Automation to find the right solution to meet our specs. And the effort has paid back." The ideal internal flow characteristics, with its maximum capacity and high duty cycle, provide better performance compared to other valve designs. The Angle Seat Valve's piston is unique, enabling the plug to retract farther from the flow path, ensuring the highest flow capacity. The dual packing design, and a large diameter self aligning stem insures the highest cycle life. These 2/2-way pneumatically actuated piston valves were originally designed for liquids, gases, steam and some aggressive fluids applications. The valve body and internal components are made entirely of AISI 316 (Ares Series) and the seals are in PTFE, therefore enabling a high chemical compatibility with almost all media used in the different production processes. 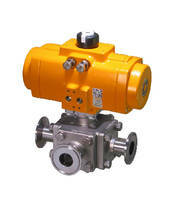 The valve is also available in Brass & 316 S/S (Zeus Series). 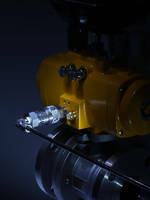 The control head rotates 360° for selective positioning of the pneumatic inlet port. 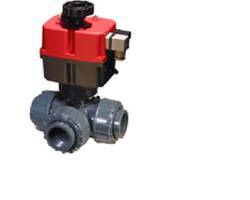 Available in sizes from 3/8" to 2", the pneumatic valve is small, but with a series of 135 jets, packs a big wave. Visitors to the park's Wave Fountain are awed by its power and well-choreographed tidal surges. Architectural fountain designers are awed by its simplicity and endurance. The waves are generated by computers which control the solenoids, and in turn drive the valves in an air tight system. The valves cycle nine times per minute. Each hour two 15-minute shows are run, for ten hours a day. With 1.5 million cycles in over a year and a half, not one valve has failed. Paul Bays, Maintenance/Operations Supervisor of Queensway Bay Parks, Recreation & Marine for the City of Long Beach reports, "With over a year and a half of usage the OMAL Ares Angle Seat Valves have performed exceptionally well, meeting the fountain's demanding requirements." The Wave Fountain measures up to the city's mission to "create community and enhance the quality of life through people, places, programs, and partnerships." Assured Automation is a privately held company that sells automated valves, actuators, flow meters, and valve accessories. Located in Clark NJ, Assured Automations customers include original equipment manufacturers, resellers, and end users. Their products are used for fluid and gas applications in air drying, pollution control, process control, laundry equipment, textile dyeing & drying, bottling & dispensing equipment, ink & paint dispensing, industrial compressors, and others. Their valves have been used reliably in curbside gas shut-off systems, award-winning architectural fountains, and many other high-profile projects. The company markets its products through a network of direct sales offices, technically-oriented representatives, and distributors throughout the world. For more information contact Assured Automation at 800-899-0553, by e-mail at info@assuredautomation.com or visit www.assuredautomation.com.